This commission was a fun one to do, and went pretty quickly. The client asked for a steampunk inspired katana that had a few key details. It needed to have scrollwork, a fancy handle, and look like it is powered. So, my first step was to collect some materials. The next step involved changing the grip into something more steampunk. I decided I wanted to integrate an empty C02 cartridge into the handle to make it look powered. So, I rounded the bottom of the grip, and then went to work cutting out a portion at the bottom of the handle. I did this with my dremel and a special rotary cutting tool to dig all the way through the thick plastic. After a few hours of shaping, sanding, and fitting the tank where it would sit, I moved on to the next step. I had some red wire on hand, so I went to wrapping the uncut portion of the grip in wire. I used a spray adhesive to keep the wire in place as I worked, wrapping around the handle. The wire was about 18 gauge, so it took a while to cover the whole area. After that, I knew I wanted to keep the sword looking like a traditional katana, so I decided to learn how to do the twist wrap you see on most katanas. This project being steampunk, I naturally chose a brown suede leather strip about 36″ long and 1/2″ wide to wrap it with. After a bit of internet research and soaking the leather in cold water, I went about wrapping and twisting. The twists were a bit bulky, so I went to the vice in the shop and compressed the leather twists against the handle to flatten them out. Stage 2: Grip wrapped in wire and leather, and scrollwork done in dimensional paint. Next, I wanted something above the cog shaped tsuka to be reminiscent of Tesla weapons. I had some 14 gauge copper wire lying in the shop, so I brought it over to the sword and drilled holes at 1″ apart to wind the wire through the sword a few times. After that, I was to the detail stage. I took my silver sharpie and sketched a few designs on the pommel end and on the top portion of the blade. I used dimensional fabric (puffy) paint to create upraised scrollwork details. After everything was dry, I masked off the grip and the copper wire so I could paint a basecoat. I chose white Krylon plastic fusion, which I knew would have the best adhesion. Then, I used silver and gold Rub n Buff to create the super shiny metallic effect. After I filled in all the little gaps and grooves with the Rub n Buff, I took black acrylic paint and began the antique process. I decided to leave the cutting edge of the blade nice and shiny, so it looked like it was being taken care of and used. It was at this stage I also decided to hang some charms off the end of the sword. My wife makes steampunk inspired jewelry, so she supplied me with some cool things to hang from the pommel. Rub n Buff applied before weathering. Did you enjoy my post? Be sure to “Like” the post below and leave a comment! I had a customer contact me about some jedi pouches he bought online. They were very inexpensive, and the paint job was not screen accurate. He asked if I could repaint the pouches to look more like they are from the movies, so I tried my hand at it. Here they are as I received them. You can see the original finish is quite plain. The backs of the pouches were damaged from th screws that held the belt clips in place, so my first step was to repair the pouches so they wouldn’t fall apart. After they were repaired with some E6000 glue, I went to paint them with acrylics. Unfortunately, the original finish was water resistant and the paint wouldn’t stick. So, I had to remove the original finish entirely with 200 grit sandpaper. After I removed the original paint, I covered the pouches in a new base coat of brown. In the next pic, you can see that I started the detail paints on the left piece, and only had the new brown basecoat on the right pouch. And finally, I gave the right pouch additional detail and painted the clasp button the worn brass/gold color you see on the screen used props. As a last good measure, I sprayed them with acrylic sealer, and off they go to the customer! The original Hansel shotgun project couldn’t move forward due to the customer deciding they did not want the prop. I did, however, get contacted by a different customer that wanted the shotgun, but needed it on a fast deadline. Reworking my construction plan, I moved forward by using the wood stock I had already made and created the barrel from foam. It’s not an exact replica, but was passable for what the customer wanted. If I receive a new commission on the Hansel Shotgun, I would love to return to the original design and plans I had set to create a higher quality product. Here are a few photos of the foam commission that I completed. After some custom leather and hardware construction, we have the final product! The lenses didn’t turn out domed like I wanted them, but the curve I achieved looks nice. These are getting sent off to the customer, and hopefully she will be very happy with the result. Taking something made from plastic and turning it into an antiqued metallic color is a multi-layered, multi-step process. I have devised my own unique way of accomplishing the look, and I’d like to share it. For the Steampunk Huntress Mask, I started with black ABS plastic sheet. The first step was to establish the metallic base color, which in this case was bronze. I chose “Dazzling Metallics” bronze acrylic paint. After about 5 coats of this bronze paint, I had a good metallic base to work from, which you can see pictured on the left. Heat Forming – I heated and formed the parts to a slightly curved shape to fit the face better and represent what’s in the original art. Then, I heat formed “wrinkles” into the wings to give them depth. Assembly – I assembled the parts with a good strong glue, and then filled gaps and sanded edges to make everything fit nicely. Paint – I started with several coats of high metallic bronze acrylic paint. Then, I blackwashed it lightly. Then I washed it in a really dark bronze. Then, I blackwashed it again and daubed it for texture. Here’s what came out, and I really hope the customer likes the paint scheme. 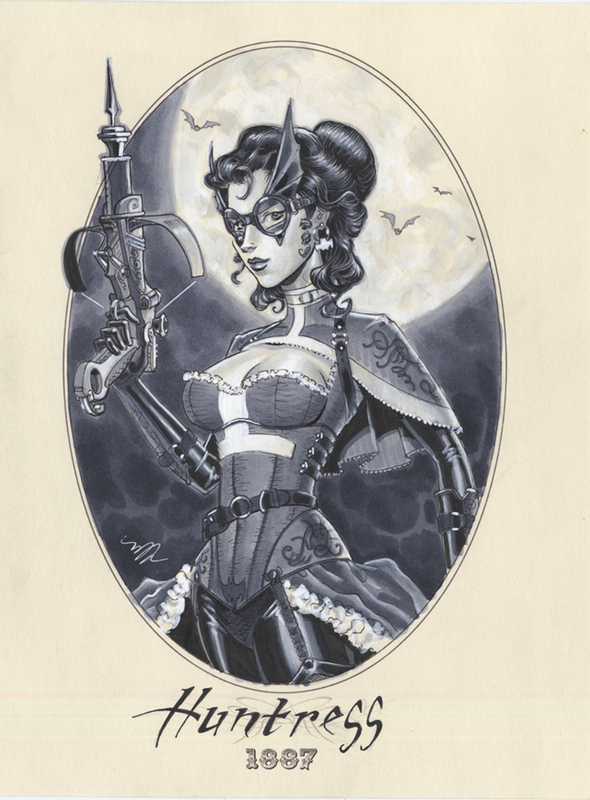 I received a commission to recreate the mask from a cool art piece of a steampunk era Huntress. 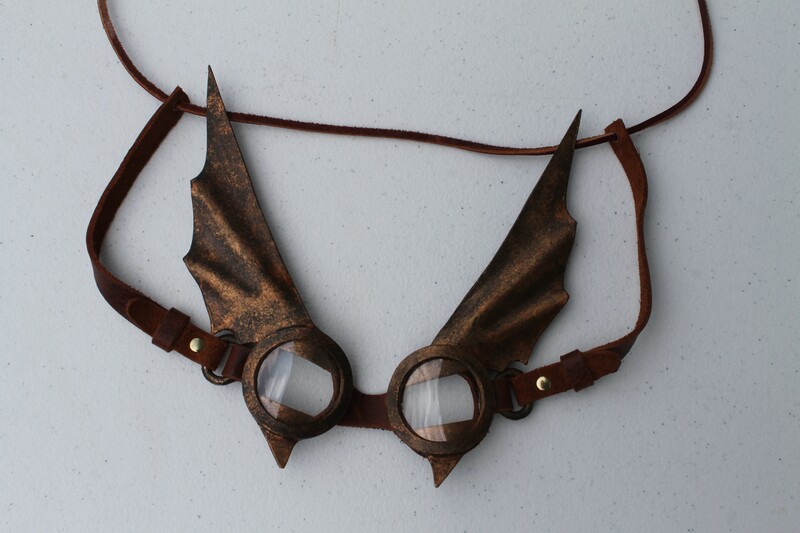 I’ll be building the mask from genuine leather and ABS plastic sheet, painted to look bronze. First, I created a vector blueprint based on what I saw in the art. Then, I separated the pieces in the vector and printed the lineart at full scale to cut out the ABS pieces. Next up: Cut out some clear, slightly domed, lenses and make the head-strap attachment hardware! Here’s a project I did for the web series, Steamworks & Shadows. I started with an Optimus Prime kid’s voice changer mask, and tore it to pieces. Then, I reassembled it with various other bits out of my shop, and then painted and weathered. I got a commission to make the shotgun that Hansel uses in “Hansel and Gretel: Witch Hunters“. This is the first project that I found I needed to first make blueprints based on reference photos. I watched the trailer over and over to see the shotgun cocking action and made the blueprint to represent the different pieces I’ll need to make it move. Once complete, this particular project will sell for $200. Here are the blueprints I made for it in Adobe Illustrator, to scale.